End of the World as We Know It? If you haven’t heard the news about the end of the world is going to happen on December 21st, 2012, then you must live in the dark ages or have no form of communication with the outside world. Everybody has their own beliefs about what will happen on December 21, 2012. The Mayan calendar seems to indicate that there will be changes happening on earth and in our way of life. So here is a little bit of history over the whole end of the world as we know it thing. 2012 prophecy has taken the world by storm and nowhere has there ever been so much excitement and theories associated with this prophecy. Many people are of the opinion that in the year 2012 or 21 December 2012 to be more precise, the world is going to end or a major part of our earth is going to be destroyed with widespread havoc and death all over the globe. Most of the doomsday enthusiasts seem to draw their conclusions from the fact that the Mayan calender is going to end on that day. 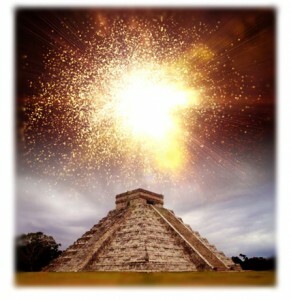 11.11 am on 21st December 2012 is a solstice and brings an end to the Mayan 5,125 year long calender. Now my thoughts on this is that there have been many people throughout history who has proclaimed they knew when the world was going to end. And what I think is that it will end when it ends. Only God knows when that will happen. We are given the signs of the end of days in Mark, Luke, Revelations and many other places. Should we be sitting around and focusing on the end times only? I don’t think so. We are told to be alert, but we must still go on about doing business and doing what God intended us to do. We shouldn’t be focusing only on when Christ will come again. We need to be going about the Lords work and bringing people to Him. We need to be witnessing and sharing the gospel while living in a world that is far removed from peace. None of us know when the last day will be and Christ comes to take the believers home. There are so many theories about that whole topic and I feel that God already knows when it will be and I won’t be changing His mind. I will just be ready. On a note , is that these people who proclaim they are believers in Christ and they say they know the exact day and time of the second coming of Christ makes those who are true believers look like a joke. This type of prophesier can be harmful to those who are new Christians or are non believers now. We are accountable for our actions and deeds and we need to make sure what we are telling others is accurate. When people ask me if I believe the world will come to an end, I answer yes. But if they ask me about this prediction, I can’t say no since I don’t know for sure. Christ could come any day minute or second. All I know is that no matter when that time comes, I want to be ready and prepared.